Thomas Revard grew up around cycling. After all, his grandparents Tom and Nancy Revard opened The Bike Line in Broad Ripple in 1979. Revard’s father, Bill, and his uncles, Jimmy and Charlie, own the Broad Ripple shop and the Carmel store, which opened in 1997. So Revard, 19, started riding bicycles at age 4 and racing at age 8. “People my age usually discover cycling in college, so it’s rare or unique to have someone that has been racing as long as I have,” Revard said. His experience is paying off. Revard, a Marian University cycling team member, was riding for his trade team, Bissell ABG Giant Cycling Team. 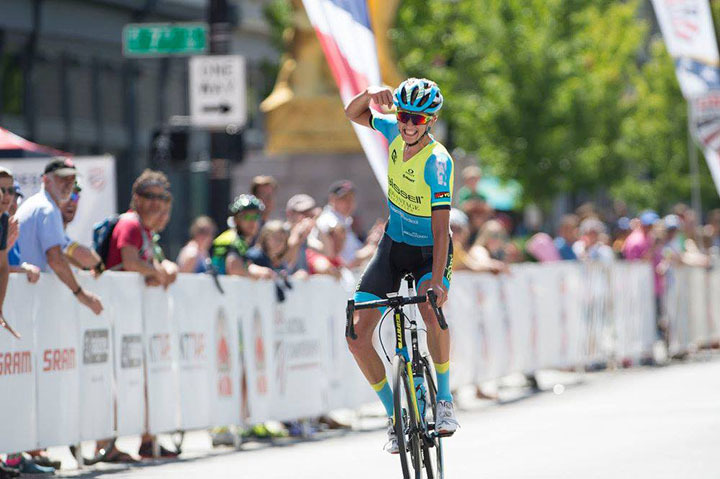 He followed up his victory by finishing third in the Indy Criterium July 8. Revard gave credit for his recent success to Marian teammate Ian McShane, personal cycling coach John Singleton and his father. Revard originally planned to compete in cycling only at Marian. That changed when Marian cycling coach Dean Peterson suggested he meet the university’s cross country coach, Michael Holman. “He’s just as great as the cycling coach, so I was like, I have to run for him,” Revard said. Revard was a member of Carmel’s cross country state championship teams in 2012, 2013 and 2015. However, he was injured and could not compete in the 2015 state finals. His best state meet finish individually was 26th in 2014 when the Greyhounds finished second in the team portion.